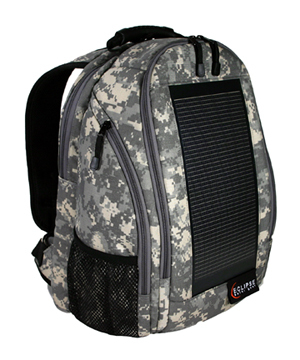 Eclipse Solar Gear introduces the new military and tactical solar backpack! March 8, 2011 - PRLog -- Round Rock, TX / Keeping your batteries charged and ready to go is a necessity for many mobile professionals. The original, award-winning, patented Eclipse Solar Gear product line is designed to enhance your mobile electronic experience by providing a convenient source of personal solar power. The new Eclipse Solar Backpack is made from Mil Spec materials including Cordura nylon, webbing, high quality zippers and buckles. The Eclipse Solar Backpacks are Made in the USA! The backpacks are made at our facility and the solar panels are made in the USA. We offer the Eclipse Solar Backpacks in both commercial and Mil Spec using 1680D luggage grade nylon or Cordura nylon. Future products include different styles and multiple colors, including; black, blue, UCP, Desert Camo, UCP, and Woodland Camo, to name a few. The Eclipse Solar Backpack features an efficient, lightweight, flexible, thin film solar panel providing up to 4 Watts of power to recharge your mobile devices and both internal and external batteries. Using a 12V auto adapter or with the USB battery accessory, the user can connect a device while in the sun or at night to recharge and extend the stand-by and “talk” time of your device. The backpacks feature multiple organizer pockets for your smart phones, iPods, MP3 players, GPS units, spare battery, and other handheld devices. The backpacks include a separate padded laptop cavity, side mesh pockets, and large side pockets. The large main cavity has room for extra clothing and gear when traveling. The military and tactical backpack features padded shoulder straps and a padded waist strap for comfort and a secure fit. See our line of solar backpacks, solar messenger bags, and solar tablet computer cases online at www.eclipsesolargear.com. Eclipse Solar Gear has been the recipient of multiple industry awards including a 2005, 2006 (Best of Innovations), and 2007 CES Innovations Design and Engineering Awards and a Laptop Magazine’s Editor’s Choice Award for the innovative solar backpacks and solar messenger bags. The backpacks and assorted carry cases feature integrated solar charging solutions designed to charge a wide range of mobile personal electronics. About Eclipse Solar Gear: Since 2003, Eclipse Solar Gear has been a leading source for innovative solar charging carrying cases designed to enhance your mobile consumer electronic experience by providing a convenient source of personal solar power.